Before technology, flying kind of sucked. You’d have to lug around giant books if you wanted to keep yourself entertained, or even worse you’d have to read those dreaded in-flight magazines (RIP Skymall.) In recent years, however, you can pretty much do whatever you want, provided you bring your phone or a tablet along for the ride. This does not pertain to virtual reality, though. For that you are on your own. 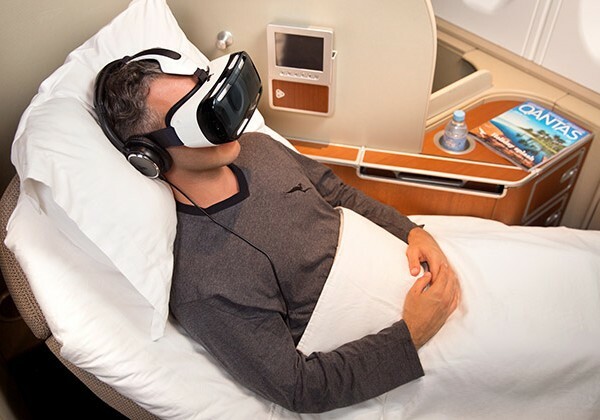 It’s not like any forward-thinking airline would begin implementing VR devices into their service, right? Wrong! One is doing just that. As previously stated, this service will only be available for first class passengers. Regular folk, like us, will have to get by playing level 345 of Candy Crush or whatever it is we do to pass the time these days. It’ll also only be available on certain flights, all in Australia, and only two will be made available for passengers to use. This means there is yet another reason for you to arrive at the airport early, and we know how that always works out.